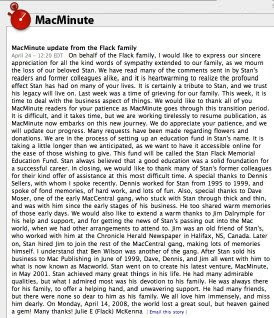 As many of you know (and read here) Stan Flack - publisher of the Mac News blog -MacMinute passed away two weeks ago. His ( I presume) daughter; Julie has posted a message updating readers with thank yous and notes. We are in the process of setting up an education fund in Stan's name. ... This fund will be called the Stan Flack Memorial Education Fund. Stan always believed that a good education was a solid foundation for a successful career. Is this something from a will, I wonder? Because I know if I ran a popular enough Mac News website, that I'm sure at my death could generate cash for charity - I would most likely want my family to make a "Macs For Kids" type charity. Not to doubt the sincerity here - but education has no bearing on success. Success is all in the eye of the motivated beholder. Maybe I should update my will now to say just that.